The UKSMG's quarterly journal, 'Six News' is the world's leading magazine dedicated to 50MHz and is a favourite with leading operators all over the world. Every issue is packed with operating news, photos, DXpedition reports, letters and technical articles. Ever since Issue No.1, back in 1982, the magazine has steadily grown in content and presentation, under the stewardship of successive editors, into the glossy multi-page journal that we produce today. With over 600 members, this requires a significant amount of time simply ‘stuffing’ the envelopes but it is well worth the effort and is a great read. 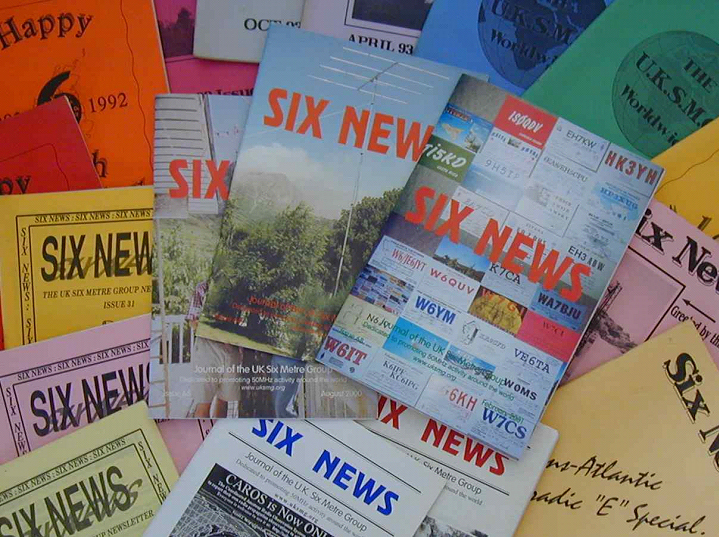 Although the majority of members still read the magazine in printed form, an increasing number opt to download the digital version of Six News from the website. It is available in a variety of formats including high and low resolution pdf and formats for a Kindle, iPad, Android smartphone, tablet and PC. This method of receiving Six News is a win for both the member and the group as membership cost is reduced and the lack of postal charges means that more of the membership subscription is available for Six Metre good causes! The digital version is available to both Digital and Standard memberships. Six News relies on input from across the whole of our membership and we are very fortunate to have some experienced and knowledgeable contributors. But we are always on the lookout for new material and as long as a submission to the editor has some relation to the Six Metre band, be it technical, operating, constructional or simply humorous, it will be very welcome. Don’t worry if you have never written an article for publication before, we will happily provide any guidance or assistance needed to transfer your work to the printed page. Send what you have to editor@uksmg.org and we will do the rest. If you are unsure whether your article will be of interest then please drop the editor a line at the same address; he will be happy to advise. If you are yet to become a member but would like to see a sample copy of Six News, then you may download a copy here.